As I keep mentioning, Lewis saw this unidentified loiterer (Hutchinson?) opposite Millers Court, while this other man & woman - being the worse for drink & hatless, pass up the court.
" I also saw a man and a woman who had no hat on and were the worse for drink pass up the court." So, someone was there. Deny Astrachan existed all you like, but there was a man & woman doing just what Hutchinson said Kelly & Astrachan was doing. Funny how the anti-Hutchinson subscribers, when faced with a character that proves their theory wrong, resort to claiming "he didn't exist". even if Aman did exist, hutch by his own account was waiting for a long time outside her place, when Aman was in there with mary. hutch could have waitied for him to leave then made his move. Last edited by Abby Normal; 07-23-2018, 09:04 AM. Have you any corroboration to your explantion for the dashes. The comma's are already present. You of all people should know a witness only responds to questions. Look at the press versions for a sample of questions asked. I cannot imagine all those interruptions which you suggest. If it was Crawford's style to cut across his witnesses to that extent, it's amazing that the inquest wound up as quickly as it did! Last edited by Sam Flynn; 07-23-2018, 11:03 AM. According to the Morning Advertiser account, the coroner put 32 questions to Joe Barnett during his testimony. You haven’t convinced anyone with your “reports of a later time of death = justification for Hutchinson’s delay” hypotheses because it makes absolutely no sense from a moral or logical perspective. Elizabeth Long saw Annie Chapman in Hanbury Street shortly before her murder on Sept 8. By all appearances, Long didn't come forward until Sept. 11th. A three day delay. Her moral perspective was obviously flawed. Lawende, Levy, and Harris saw a woman they believed to have been Eddowes just outside an entry into Mitre Square. They undoubtedly learned of the murder later that morning, but certainly didn't rush down to the nick. They appear to have been discovered during house-to-house inquiries on Oct 1st --some 36 hours later. For all we know, they never would have come forward. A lot of people are hesitant to get involved, Ben. Witnesses come forward days later, weeks later, months later. Anyone who reads true crime knows this. not ones who know the victim well, especially if theyre friends, and usually theres an obvious and innocent explanation for it, and we don't really know what caused hutchs delay. That rules Hutchinson out then. Is there any indication he did? We can accuse him of anything, but that doesn't mean a whole lot. Doesn't an accusation normally require evidence? From what Hutchinson told the press, "I met the woman Kelly, whom I knew very well, having been in her company a number of times." He is admitting to being a client of hers, and that to police he said he had, "occasionally given the deceased a few shillings". Which being a client "a number of times" sounds reasonable. No mention of them being friends. Ilove the way you twist and move the goal posts as you go along with the arguments wick. This is your statement that started this line of debate if youve forgotten already. so Aman dosnt prove the theory wrong-as i said, hutch could have even been telling the truth about him, and he could still be her killer, as hes standing out there waiting for Aman (or someone else) to leave. but when your reasoning is demolished off you go. It be nice and your credibiity would hold up better if you just admitted your mistakes every once in a while or at least you see someones point. ever heard of circumstantial evidence? people get sent away everyday on it. but its actually a moot case anyway since this isn't a court of law-just abunch of us arm chair detectives debating on a public forum. lol. No shift workers allowed then. You can't stay at the Vic. if you work nights? Closing the lodging-houses for cleaning happened over night. What’s this “normal activity of a serial killer” you’ve suddenly become obsessed with? Was it normal, yes or no? "We don't know what Hutchinson said to the PC, or what the PC told Hutchinson to do, if anything." Why didn’t he follow the PC’s advice and go to the police station? According to you, remember, a fellow lodger had just lent him a copy of Lloyds Weekly News with its “revelation” that the medical examination supported an early morning, small hours time of death after all. Regardless, the same paper repeated both stories by M.Lewis & Maxwell. The other Sunday paper - Reynolds did not move from the late morning ToD. 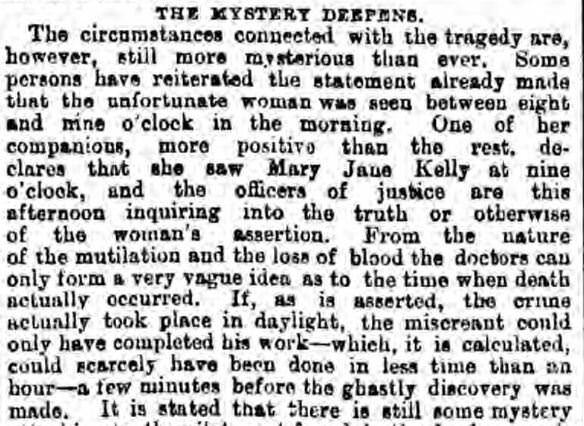 "...the crime actually took place in daylight..."
The medical opinion is, "only a vague idea"? So, what is he to do? The point was, they are not consistent. A window of two hours (1:45 - 3:45) is not "slight". What was demolished?, I'm still here.